Well, it's a funny old world. Here we are with CD allegedly dead in the water and one of the most keenly-awaited products in a while is a – wait for it – CD player! The experienced audiophile won't be too surprised at that, given the history of LP replay since the 1980s. And, as for the brand that's making the splash, Audiolab has been on and off the radar a bit over the years, including the spell as TAG McLaren Audio and is now very keen to ensure a lively future by launching eye-catching products. So just what's so eye-catching about a CD player? Basically two things: funky new design and internal technology. There are some unusual features externally, too, including multiple digital inputs and user-selectable digital filters. We've seen both those features before, but not often in quite this much detail and there's an attractive additional extra to the USB input, in that it receives and plays back high-resolution audio (24-bit/96kHz sampling). The majority of USB DACs are limited to 16-bit/48kHz as a function of the hardware in them, but new chips only recently made available have increased this to 24-bit/96kHz and Audiolab has got in quickly to implement that. As for internal design and technology, it may ring bells if we mention that the designer of this CD player is one John Westlake. John was a bit of a cult figure in the late 1990s, thanks to his digital design work for Pink Triangle, which did nothing to diminish that company's reputation for individual, freethinking audio products. Products that included one of the earliest DACs with selectable filters, though in that case the selection process involved buying and plugging in a whole filter module. Fast forward to 2010 and it's much easier to design filters in software and implement them at the touch of a (remote control) button. In this case, four filters are on offer, with fast roll-off (basically the 'standard' filter used in most players since the year dot), slow roll-off, 'Optimal Frequency' and 'Optimal Transient'. The last gives an impulse response completely lacking in the usual preand post-ringing, while Optimal Frequency has practically no aliasing at all and an extremely rapid roll-off between 20kHz and 22kHz. A fairly quick comparison was enough to convince us that, as we've often found, the fastest roll-off option (Optimal Frequency) gave the best fine detail and tonality and we stuck with that. The central core of any digital audio device is the DAC and Audiolab's choice here is a chip we haven't come across before, from Canadian company ESS. A most impressive spec is implied for this chip, 32-bit conversion at over 84MHz. As stated, that's actually largely meaningless, though if you are technically minded and care to read the white paper and patent details from ESS, you'll find that there is certainly some quite-clever thinking in there. On the other hand, we're happy to give Audiolab credit for the sheer thoroughness with which this player has been designed. The power supply arrangements are something to behold, for a start. On removing the player's lid, there's a plethora of reservoir/smoothing capacitors and an impressive number of regulator chips too, signs that extensive measures have been taken against power supply contamination and cross-coupling. This isn't revolutionary stuff but it's well above par for a device in this price category. Ditto the use of discrete transistor (instead of op-amp) analogue stages at the output. Op-amps handle some of the audio processing, along with notably good-quality passive components. Less obvious internal stuff includes strenuous measures against jitter, applied both to the internal transport and data from the digital inputs. Again there's a certain degree of spin applied here and terms like '100 per cent jitter attenuation' require slight qualification, but it's clear that the DAC chip and the circuits around it have some very serious jitter reduction measures built in and, short of jitter so bad it causes stuttering (which would imply a seriously broken source), that particular bogey seems to have been rendered harmless. Build quality is highly creditable. You don't get a thick front panel, nor anything fancy in the way of display or controls, but both internally and externally the player is well assembled and finished and it's also pretty smart. The display does show CD text information, which is a nice touch to have and is unusually informative about incoming data when the device is used as a DAC, showing both sampling rate and word length. Balanced outputs are a plus, too. We're inclined to be a bit cynical about claims for millions of bits and super-high oversampling ratios because these things don't always translate into better sound, but it's always intriguing to see what the latest bit of super-tech does actually sound like. 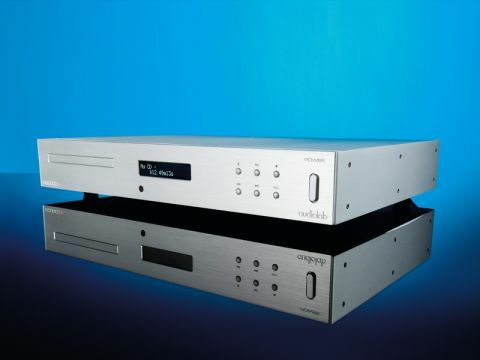 As it happens, the 8200CD was one of the first bits of review equipment we listened to via a recently revamped reference system (speakers cleaned inside and out, room rearranged and so on), so it was a doubly exciting experience. Bearing in mind the risk of getting carried away by such felicitous circumstances, we were at first disinclined to be too gushing in our notes on the new Audiolab, but as things went on and we became more sure of our reference points, we began to see some reasons why Audiolab's people are so full of beans over the new baby. We've become accustomed to high standards of CD replay, so we weren't much surprised to hear plenty of detail, good bass and treble extension. Other basics are also well dealt with, which is very commendable, but not eyebrow-raising. What really caught our imagination, though, was the sheer togetherness of the sound. More than anything, that seems to be the hallmark of this player. What do we mean by that? Prosaically put, it's that there's excellent integration between different aspects of performance. That always happens in live music, but not by any means invariably in reproduced sound. Bass may be good most of the time, but becomes uncertain when the midrange gets busy, or detail may suffer at times when the treble's particularly bright. In this case, by contrast, the firm bass just seems to get even firmer in the presence of activity higher up the band, while detail is consistently precise. As a result, music comes across with an unusually high degree of physicality, less vague than it often feels. Recordings are odd: since the earliest days of 78s, people have proclaimed that they sound 'just like the real thing' and yet improvements continue to be made and are readily apparent to anyone who pauses to listen. We're not saying that the 8200CD is leaps and bounds ahead of the rest of the world. Indeed, we've heard esoteric players and DACs that can match it in any and all areas, but it rather impressively exceeds expectations for a mere £700 and, in the process, does make the point that many of its competitors just don't quite gel sonically. A couple of concrete examples might help illustrate this. One recording we've enjoyed a lot is the Brahms German Requiem on Harmonia Mundi (we used the SACD layer to audition the players in this month's Blind-Listening Group Test). It's a well-made recording and on most CD players it has a lovely tonal balance, beautifully natural dynamics and very good imaging, too. But on the 8200CD it had that certain something extra, the last little bit of focus that made it all seem real, pinpointing the positions of the performers and crystallising their individual instrumental and vocal timbres. In similar vein, an old favourite by Ian Dury showed more than ever, just how sharp and snappy his band sounds. The 8200CD also brought out like never before all the musical invention of the accompaniment and the humour and biting sarcasm in the great man's voice. We'd spotted these things before, but the achievement here was in reminding us, dramatically and emphatically, of it all. Rediscovering familiar tracks like that is always one of the most joyful effects of good new hi-fi! So in summary it's very much the musical and communicative skills of the 8200CD that we found ourselves enjoying, however fine its measured performance (which at least comforts us that we weren't hallucinating). We'd have to say that if you're thrilled to bits with your current setup that's great, but if you audition this player it could just make you a teensy bit dissatisfied with things as they stand – and we all know where that road leads. No doubt there will be some who just don't click with it. That's OK too – musical and sonic tastes vary and we wouldn't dream of dictating on the subject. If you already own equipment of the dCS/Meridian class this won't make you turn unfaithful to it. But if you're in the market at anywhere up to, at least, a grand, the 8200CD could just be the piece of equipment that makes you want to say in the demo room, "Where's the cash register?"